Well known for their jolly and pleasant attitudes, the Cocker Spaniel is a crowd pleasing breed. They are rather playful and full of happiness most of the time, making this type of Cocker a joy to be around. Not a notable hunting breed, but is quite curious and would adore residing on a farm setting in the countryside. Just as humans vary, Cocker Spaniels do as well. They can be very omitting and pleasing pooches, or they can be somewhat noisy with their barking habits. Bouncing with energy and always happy to greet their owners, the Cockers are a breeze to train to become very loving and obedient canines. Cocker Spaniels do not require an immense amount of exercise compared to other dog breeds. They will suffice with a daily stroll on a leash around the neighborhood to keep their physiques strong and mobile for years to come. While they do not desire as much activity as other dogs, they do require more attention to their grooming than others. They have thick coats of fur and will need trimmed or at least brushed a few times per week to keep it clean and well maintained. The Cocker Spaniel also needs the owner to care for their feet, eyes and ears. These dogs commonly obtain an excess amount of dirt trapped in their feet and their ears need additional care simply due to the manner in which their heavy ears lay along with the amount of fur allowing more debris inside. Cocker Spaniels are relatively easy dogs to tend to for years of family enjoyment, but there will come a time when you may need to have them looked at. As they get older, they have a tendency to develop eyesight issues such as cataracts, glaucoma and cherry eye. They can also suffer from patellar luxation, urinary stones, overactive thyroid and liver disease. Cockers can also attract otitis externa and CHF. 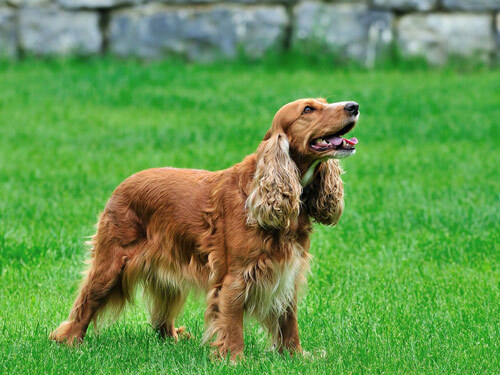 Congestive heart failure is common in these smaller dogs, usually one good rule of thumb to steer clear of your Cocker Spaniel developing it is to guide the dog to remain at a healthy weight. Dogs that are older and overweight contract CHF much faster than ones that are not. Cockers have a full life span of twelve to fifteen years on average and some have rare ailments with epilepsy and gastric torsion. Testing recommended by the vet for Cockers is for the thyroid, eyesight, knees and hips. Well over two centuries ago, the Cocker Spaniels began what would be their long journey to becoming one of America's most beloved hounds. Used for their small size to hunt prey such as quail and birds, these gundogs continued to rise in popularity until they were recognized by the AKC in the early 1900's. Cocker Spaniels are one of the top breeds residing in homes in the United States, and in the mid 1900's they reached popularity in England as well. Their affectionate nature and variety in fur coats will continue to increase their popularity for decades to come.